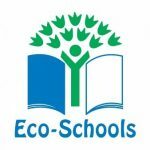 Our Eco team is comprised of children who care deeply about environmental issues, and wish to make a positive change to the school and general environment whilst raising awareness to their peers. Children from all classes from Year 1 to Year 6 meet to discuss these issues, and to generate ideas to make improvements within the school building and its surroundings. Eco-Warriors also have folders to keep a record of their daily duties around school which focus upon energy and water saving, recycling and litter. We are currently working towards achieving our Eco-School bronze award and are developing a wildlife area in our woods.